The talks are very much under the radar, but success would have benefits for both sides. It took almost two years of consultations, but in April Japan and the EU finally launched the first round of official negotiations for a free trade agreement (or economic partnership agreement). If negotiations are successful, the agreement is expected to boost the bilateral trade and investment relationship, as well as have a positive impact on their respective economies. Despite the potential for such an agreement, though, one would be forgiven for having missed it altogether. The negotiations have received limited media coverage and government officials have made only perfunctory statements. The first and second round of negotiations took place from April 15 to 20, 2013 in Brussels and from June 24 to July 3 in Tokyo. Both sides called them a good start. The next round is due to be held in Brussels in October 2013 with a further round scheduled for early next year. If completed, the agreement will be the conclusion of decades of negotiations, bilateral agreements and numerous declarations. With a stated aim of tackling trade frictions and empowering economic relations between Japan and the EU, the FTA is meant to eliminate trade barriers, open the public procurement market, and enhance cooperation on issues such as intellectual property. Though the main sectors of interest are heavy industry and agriculture, the agreement is expected to have a positive impact throughout the economy. Initial estimates speak of a boost to Europe’s GDP of approximately 0.7% and the creation of 400.000 jobs, while Japanese exports to the EU could increase by as much as 23.5%. Considering the dire circumstances in which both economies find themselves, the timing couldn't be better, especially since bilateral trade has been in decline for a number of years. Given their economic prominence, combined accounting for one third of global GDP, one would expect that EU-Japan FTA negotiations would attract widespread attention. Instead, there has been limited promotion from both sides coupled with only modest media coverage, largely confined to plain reporting. The stark contrast with similar initiatives such as Japan's Trans-Pacific Partnership candidacy and the EU-USA FTA talks suggests that Japan and the EU have not put their agreement high on their agendas, nor do they find any reason for advertising it. But why would two economic giants downplay such an important deal? Despite their declarations about “sharing a common future” – to borrow the title of the 2001 EU-Japan Action Plan – the two actors do not, in fact, appear to share a grand vision for a future strategic partnership. Limited cultural ties and lack of geographic proximity could perhaps be one reason why they invest only small amounts of political capital in the partnership. China, however, has even less of a common ground with the EU, yet that hasn't stopped the major European players in pursuing closer ties. The absence of a coherent and effective European strategy towards East Asia, especially when contrasted with the long established U.S. predominance in the region, could be a more important barrier to closer cooperation. As Henry Kissinger famously observed, European leadership is not summed up in a single telephone number. 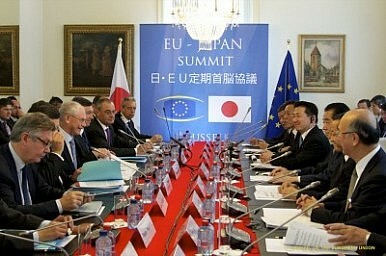 The complexity of the EU policymaking process does not play well in a country with Japan's political culture. To quote the Tokyo Foundation's Michito Tsuruoka, this results in a reverse capability-expectations gap, as Japan expects less from Europe compared to what the continent can offer. With the EU experiencing something that to many external onlookers looks like complete paralysis, the prospect of a partnership vis-à-vis future challenges may become less appealing for Japan, especially when the new government is taking on an ambitious domestic agenda. As a result this gap could become even bigger, undermining the long-term prospects of the relationship. The potential for closer links between Japan and the EU is too important to ignore, not only for both sides themselves but for the world economy in general. Tokyo and Brussels ought to work on developing their partnership, which could be a valuable aid against the challenges they are facing. Paying more attention to it, and inviting the rest of the world to notice, would be a good first step. Can the EU-Japan Deal Prompt a US Recalibration on Trade?Green Shoots Sighted for Asia’s EconomiesAn Oil Discovery Before Systemic Reform in Pakistan Would Be a TragedyIn Myanmar, Jittery Investors Threaten Long-Term DevelopmentAsia’s Elections: Market Moving or More of the Same?